during the fall color season. A note about this event. In 2017, the Tryon Rotary Club decided to not stage this event anymore. Since they have elected to stop this event and they will not allow anyone else to run it, I have put the last web page I had about the event back on line minus the tour registration section so that those that wish to ride this route may be able to do so any time they wish. I would recommend that you pay close attention to the weather when riding in the summer as the mountains will and do develop their own weather pattern in the mid to late afternoon. Storms are know to have a lot of lightning and the rain is short lived but come in the form of a down pour! One of the best times to do this ride is in the fall color time. The weather is pleasant and the color is out of this world. Remember that this web page is geared to July 4th so please keep in mind this is what is refered to below. So please enjoy this tour as it is really a beautiful route. 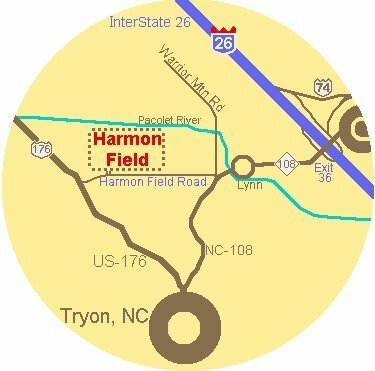 The Tour follows an especially beautiful route beginning and ending in Tryon, NC, at the Harmon Field Complex.. It is not only a very scenic, but also a very fasssst course to ride. Leaving the starting line, the route makes a quick run around Warrior Mountain Road, then on to NC-108 to US-176 into and through Tryon. We continue down US-176 to the NC / SC State Line. From here, we branch off for a easy roller coaster ride through the beautiful Hunting Country area. Lots of horse farms and we will also pass FENCE Equestrian Center. We then pass by the well known Red Fox Country Club. From here we go down into the peach country getting near the Cherokee Foothills Parkway or SC-11. 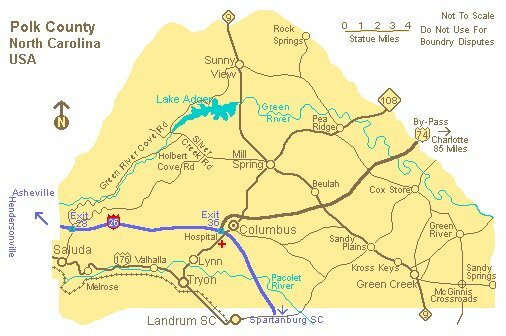 Then we return to take a tour through the town of Landrum SC. Passing by the Fire Station on the exit from town, we then move back into the lower Hunting Country Area. After short jog up "little grunt hill #1", we have arrived at the Lake Lanier entrance. With a jog to Lanier Street we head up to Butter Street and out to Oak Grove Road in the "Dark Corners Area" in route towards Route 11 once again. Now that you have ridden out to Route #11, (remember this is July) and gone along the base of the mountains that you are going to climb - there is this famous little hill up and over Callahan Mountain by the Camp Old Indian Boy Scout Reservation. We call this little hill "Big Grunt Hill #2"! This one really does separate the men from the boys very fast. After a little breather while you coast down by Camp Old Indian, you will arrive at the base of the Greenville Watershed and the Water Shed Dam. Water stop #4 is located here and you need to stop to tank up before you start the 10 or so miles up to Saluda. Remember that it is all up hill from this point till you get to the crest of Saluda, the highest point on the route. So we now leave water stop #4 and head up the long and progressively steeper climb through the fantastic, very cool Greenville Watershed. SAG's are not allowed to stop and wait in the watershed. They will ticket you for doing so if they catch you. When you exit the watershed, you have one more little ~ short ~ steep climb to the crest of Saluda. Now a fast trip down into the historic little town of Saluda. By this time if you are not with the lead pack then you have been left in the dust, because you ain't going to catch up ! ! ! When you enter Saluda on a down hill - remember that there is a right turn across the tracks at the bottom of the hill in Saluda. Please be ready for this. No crashes allowed here - you have been warned ! ! Now hold your breath as you zip down a very fast, winding five mile run down the Saluda Grade on US-176 back to the finish line. Please be very careful on this descent and ride within your limits. REMEMBER that you have a LEFT TURN after you cross the Pacolet River Bridge to get to the finish line. This bridge is at the end of a long flat straight section at the foot of the grade. Go straight and you ride the course all over again <:) Hehehe. So that is the tour and is loved by all who ride it. Any time you want to ride the route ! Suggest start time is 8:00 to 9:00 AM. Park along the side of the road inside the complex. stone pillars at the main entrance. over near the Long Building and Playground. F R E E ! ! ! 4 arrows + turn arrow. are well warn so carry the map below. This is recommended to cool yourself off. the end of the long building just before the running track. There is a sign saying NO DIVING ! ! FOR FIRST TIME MOUNTAIN TOUR RIDERS. Training is a must for this Tour. Note this climbing chart below. your legs will let you know it! Total Climbing of about 7680 Vertical Feet in 68.3 miles. This information was compiled from the Delorme Topo Maps. Below are maps done in the DeLorme Topo Program. your have never ridden this route. You can get lost otherwise. Remember this is July ! and higher than 95% Humidity. or at least water stop 4 or you will be out in the full sun Roasting ! At least a 35 inch gear for Cat 5 / Tourist or Beginners. You don't understand this mess - your bike shop will ! Go see them and get the right gearing! Divide the front chain ring teeth by the rear cog teeth and multiply by the wheel size. For convince on a road bike we use 27" for the wheel size, a mountain bike may use 26", or in the case of a small bike 20" tire, you would use 20". If you multiply the in-gear by the constant (pie ) 3.1415 , you will get the distance traveled in inches, with one complete pedal revolution. The lower the in-gear, the shorter distance traveled per pedal revolution, but it is easier! Note: The wheel size is not a consideration when computing the distance traveled with one pedal revolution. It is only brought into consideration when calculating the in-gear. The number 27" for a road bike is approximate since tire sizes vary and today's bikes use 700 C wheels. The change is so small most folks don't worry about it. Incidentally, if you know the in-gear and the pedal revolutions, you can calculate the bike speed as follows. but guess what, your local bicycle shops know how to do it for you! From the North travel I-26 South to the US-74 Exit at the bottom of the long Saluda grade. Take the exit and the next exit which will be for NC-108 - Tryon / Columbus. At the traffic circle, take the First EXIT west to Tryon and Proceed about 5 Miles west and turn onto Harmon Field Road. This is a very Crazy Intersection but just veer off to the right - do NOT make a hard right turn and then go down to the west end of the complex where the horse Riding Rinks are located. Turn in here parking along the left side of the road off the pavement. From the South take I-85 to Spartanburg SC or I-26 from Columbia SC. At I-26 Interchange you will travel North on I-26 to the Columbus NC Exit. This exit has a double "traffic circle" - one on either side of the over pass. Go around the first and cross over I-26 then exit the traffic circle and head WEST on NC-108. Again about 5 miles to the parking area. Go down to the Horse Riding Rinks and turn in here parking along side the road off the pavement. From the East take US-74 to the First Columbus NC Exit and get off turning LEFT onto NC-108. Proceed through Columbus and the two above traffic circles to the parking area. The total distance is about 8 miles. See the maps below . Enjoy your ride and come ride again!